Corcomroe Abbey dating back to the 12th century is named "Sancta Maria de Petra Fertilis", or Mary of the Fertile rock which describes its position in a sheltered, fertile green valley of the Burren, derived from the Irish, "Boireann" meaning a Stoney Place, surrounded by bare grey limestone mountains. Further evidence is found in the carved flowers of the stone capitals, unique in Europe and thought to depict bluebells, or more likely the harebells commonly found throughout the Burren Evidence of earlier religious settlements are found close by in the deserted churches at Oughtmana, suggesting a long history of ecclesiastical life in this once remote valley. 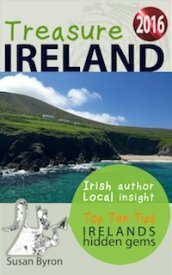 These were very wealthy baronies back then whose Bishop's feasted on teh finest oysters in Ireland which came from nearby Dooneen Bay and gave their name "Bishop's Quarter" to the beach in Ballyvaughan. Heavily patronised by noble lords and knights, in return for religious pardon for their wrong doing it seems their only reward in reality on this earth at least, was a cold carved stone effigy in a now deserted church and graveyard. 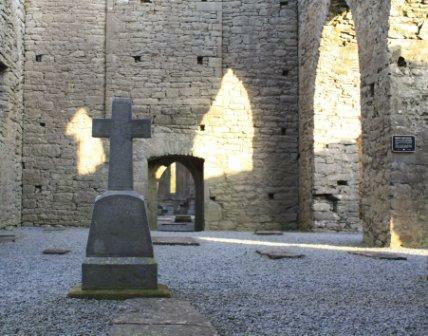 Corcomroe Abbey was brought back to life several years ago with a Dawn Mass on Easter Sunday initiated by the late John O’Donoghue who wrote "Anam Cara" and sought to connect religion with local tradition, culture and the environment. This was a marvellous and very popular ecumenical event. Modern day pilgrims made the long silent walk up to the old abbey in darkness at about 5.30 am symbolising the journey from darkness into light. A huge bonfire burned in the corner while John welcomed the congregation, often a mix of locals, tourists and local musicians. After blessing us all with seawater and giving general absolution we listened to the dawn chorus and watched the sunrise before moving into the Abbey for Mass. After which many celebrated the day with a picnic breakfast amongst the headstones or visited their relatives in the graveyard. It was a "real" experience and for many like myself who had long since lost interest in or respect for the Catholic Church it filled the void of a spiritual connection. Sadly it was abandoned the year of the foot & mouth scare and with John's untimely passing in 2008 it is highly unlikely to ever get going again, but then no one ever could really take his place. "Go dtuga Dia suaimhneas d'anam"
1	Look out for the ringfort dissected by the road on the way out, identifiable by the raised circular mound topped by hawthorn trees. 2	Hike up to the holy well at Oughtmama said to be a cure for eyes or better still take a guided walk with local heritage expert John Connolly of Burren Walks across the fields to the forgotten churches, available twice daily in Bellharbour. 3	Take a walk along the green road which circles Abbey Hill, access behind New Quay church, with fantastic views out over Ballyvaughan, Black Head and Galway bay. 4	Drive out to Aughinish via Nogra first left on way to Kinvara, follow the road along the causeway, check out the Martello tower one of only two on the West coast of Ireland built to defend against Napoleonic invasion, which of course never happened. 5	Another hidden gem is Wilde & Wooley Murtyclogh, a small single handed cottage industry. Anto Hennsey, with a background in marine biology, brings her unique appreciation and understanding of the local environment into the exquisite knitwear she designs and creates. The colours and textures of the yarns reflecting the light, landscape and architecture of the Burren, each piece is a work of art. 6	Russell Gallery browse through the works of local artists, home of raku ceramics potter Andy and his wife Stephania who has brought an Italian flavour to this part of the world. 7	The Flaggy Shore worth another mention in case you missed it? described by our own late, great poet Seamus Heaney (God Rest him) as capable of ‘catching the heart off guard and blowing it open’. It is a tarred road used as a walk, encircling the coast at New Quay. 8 Cois Linn B&B stay in this traditional style family run bed and breakfast in right in the heart of the Burren at Finavarra just a stones throw from the Flaggy Shore. 9	Linannes Lobster Bar New Quay for atmosphere, good Guinness and fresh seafood with a breezy, sea view or in front of a roaring fire. 10	Linalla Icecream treat yourself to an artisan icecream homemade by the Fahys from their own farm milk at Finavarra point, near the Martello tower might just round off the day nicely for you.